Les Carnine speaks at this year’s luncheon for benefactors and scholarship recipients. 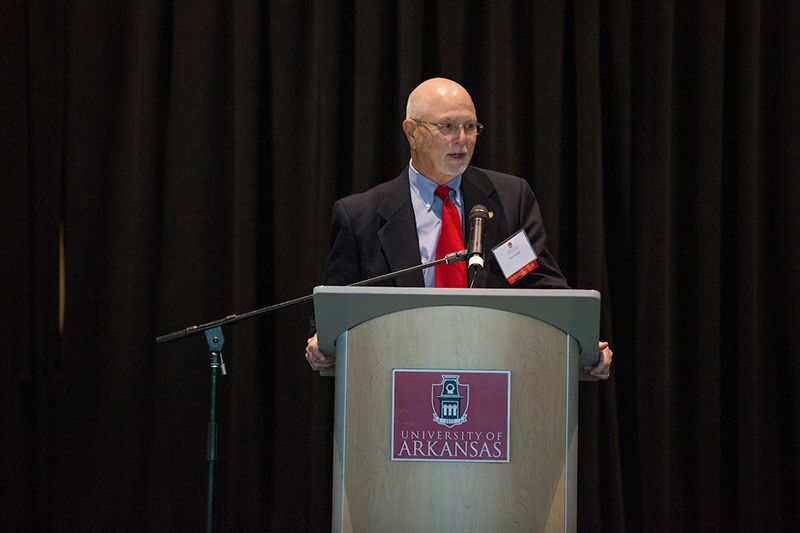 Every year, benefactors who create scholarships for University of Arkansas students in the College of Education and Health Professions have the opportunity to meet some of the recipients. Every year, the students hear why these benefactors feel the need to give to the U of A. The event is a luncheon that gives benefactors and recipients a chance to talk and get to know each other before listening to speakers. This year, the scholarship recipients heard from Les Carnine about how far he and his wife, Linda, had come since they were newlyweds sitting at the kitchen table 52 years ago planning their future. They didn’t have much at the time but they put into a place a plan that allowed them to save money and eventually give back, most recently by creating a scholarship for students in the educational leadership program of the college. Carnine said he also learned over the years that anything he achieved – from his first teaching appointment to becoming a school superintendent to serving in the state legislature to conducting research for the educational leadership program – was because of the support of other people, including parents, family, friends and teachers. He also told the students to understand that money doesn’t necessarily follow service but service provides a different kind of satisfaction. Carnine earned a doctorate in educational administration from the U of A in 1969. He formerly served as superintendent of schools in Little Rock, Texarkana and Wichita Falls, Texas. He has also been a college professor, teacher, counselor, principal and bank officer. He served as executive in residence in the College of Education and Health Professions before being elected to the Arkansas Legislature. Carnine served on the Dean’s Advisory Council for the College of Education and Health Professions and was honored as the first recipient of the college’s alumni award for exceptional professional and personal achievement and extraordinary distinction in the education profession in 2011. His wife, Linda, also had a long career in education. Chancellor Joe Steinmetz also spoke at the event. He suggested to the students that they thank their benefactors by earning their degrees and doing something significant with their lives, as well as contributing toward the education of others later. Unmet financial need is one the leading reasons students drop out of college, he said. “We are grateful you have chosen to support the dreams of the people here,” Steinmetz said to the benefactors. Bailey Hutchens of Frisco, Texas, a nursing student who will graduate in December, spoke on behalf of the student recipients. She told about how her circumstances changed after she lost her father to cancer and the vital role scholarships played. Hutchens, who was one of 15 students who traveled on a study abroad trip to Ghana last summer, would like to work after graduation in a critical-care setting, specifically with children. She would also like to work in third-world countries after she has gained more experience. She’s considering a graduate degree to become a nurse practitioner. For more information about the impact of philanthropy on the U of A campus, visit the giving website.